Today is a very important QI anniversary can anyone guess? Is it a first tv show? It is the day in 1954 when Great Britain defeated France to capture the first ever Rugby League World Cup in Paris in front of around 30,000 spectators. November 13th 2003 Stephen Fry said the immortal words for the first and only time. "But way out in front, it's Alan with 23 points"
A day to be remembered indeed!! Saying that my dream team would not involve any females....mmmmm... unusual! I think Paul Merton would be fantastic, but how many questions would you get through? He'd hijack the whole show! It'd be funny though. Tom Lehrer would be funny. Jeremy Clarkson and Jo Brand. i admit now, i was tempted to put marilyn manson, but fair play! the man is intelligent!!!! What's that? It's been done? Ah. 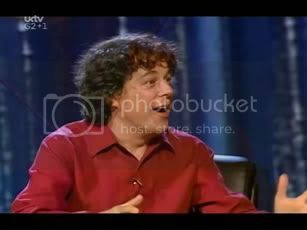 A panel of Alan Davies, John Sessions, Bill Bailey and Sean Lock would suit me fine.